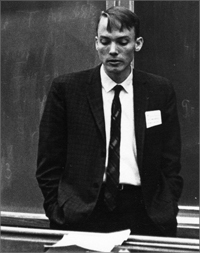 William Happer is Cyrus Fogg Brackett Professor of Physics at Princeton University (1993-present). Other institutional affiliations include the United States Department of Energy and Columbia University. His research interests include optical and radiofrequency spectroscopy of atoms and molecules and spin-polarized atoms and nuclei. July 27, 1939Birth, Vellore (India). 1960Obtained BS, University of North Carolina, Chapel Hill (N.C.). 1964Obtained PhD in Physics, Princeton University, Princeton (N.J.). 1964 – 1980Research Physicist (1964-1965); Instructor to Professor, Radiation Laboratory (1965-1980); and Director, Columbia Radiation Laboratory (1971-1978), Columbia University, New York (N.Y.). 1976 – presentMember (1976-present) and Chair, Steering Committee (1987-1990), JASON Defense Advisory Group. 1980 – 1991Professor of Physics, Princeton University, Princeton (N.J.). 1987 – presentMember, Board of Trustees, MITRE Corporation. 1991 – 1993Director, Office of Energy Research, United States Department of Energy. 1993 – presentProfessor of Physics (1993-1995); Eugene Higgins Professor of Physics (1995-2003); Chair, University Research Board, Princeton University (1995-2005); and Cyrus Fogg Brackett Professor of Physics (2003-present), Princeton University, Princeton (N.J.). 1997Awarded Herbert P. Broida Prize, American Physical Society. 2000Awarded Davisson-Germer Prize in Atomic or Surface Physics, American Physical Society. 2002 – 2005Member, Science and Technology Advisory Committee, United States Department of Homeland Security. Research Physicist; Instructor to Professor, Radiation Laboratory; and Director, Columbia Radiation Laboratory. Obtained PhD in Physics (1964). Professor of Physics; Eugene Higgins Professor of Physics; and Cyrus Fogg Brackett Professor of Physics. Member, Science and Technology Advisory Committee. Received 1997 Herbert P. Broida Prize and 2000 Davisson-Germer Prize in Atomic or Surface Physics. Member and Chair, Steering Committee. Secrecy and physics [sound recording], 2010 February 13.